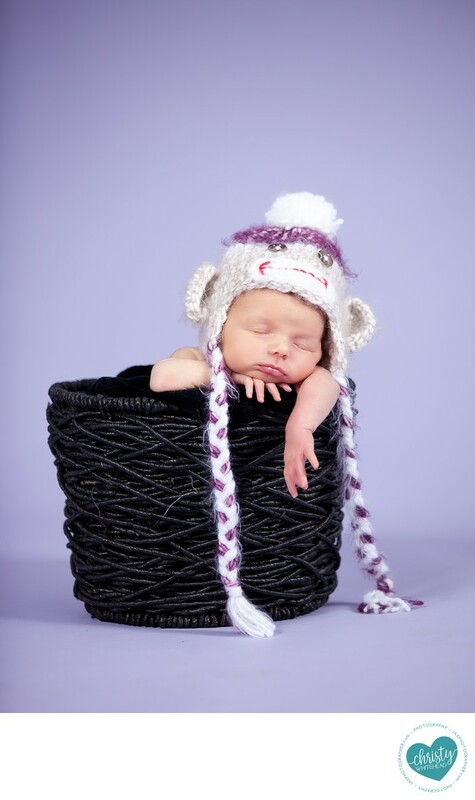 Pop Of Purple With This Little Sock Monkey Newborn JAX - Newborn Photography | Schedule Your Newborn Shoot Today! Schedule your session early, while you're pregnant is actually the ideal time! Especially because, newborn photos should happen within the first 12 days of life. Plan around your babies schedule. It's best to take newborn photos while your babies sleepy so nap time is ideal! Avoid scheduling during times your baby is usually awake and alert. Feed your baby prior to leaving home and expect them to be extra hungry throughout the session. Even though they're sleeping through it, newborn photography is a lot of work and they might be more hungry than usual! Don't forget the parents! No newborn photo session is complete without you, the parents. We know it can be an exhausting time but come prepared to join in the session. If you have any cherished items like a favorite toy, family blanket or wedding memento be sure to bring it with you. Bring up any ideas, color schemes or themes you might want at the consultation so I can have poses, backdrops and props ready. Need baby photography in Jacksonville, Florida? Christy Whitehead Photgraphy is here to help with your photographer needs.